Si Sang Wan Waterfall Located at Pha Daeng National Park, Ban Nong, Tambon Muang Na, Chiang Dao district, Chiang Mai. In 1867, the Princess Mother Srinakarin. His Royal Highness Crown Prince Maha Vajiralongkorn visited the base of Operation 503 Ban Na Wai, Muang District, Chiang Dao District, Chiang Mai Province. Then went to eat lunch at Nam Na Wai Waterfall And named this waterfall. "Srisangwan Waterfall". 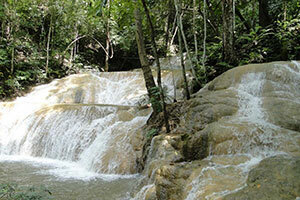 A limestone waterfall It has a width of about 10-12 meters with a height of about 20 meters. The waterfall will fall down into four layers: 1st floor: Kha Nueng Ha, 2nd floor: Chong Thara, 3rd floor: Ngam Na Tee, and 5th floor : Srisangwan. It is easy to walk up the waterfall because it is limestone, so it does not slip. The waterfall has large vegetation. The atmosphere is perfect for relaxing.